Our research is funded from grants that support fundamental questions about how nanotechnology, polymers, and other advanced technologies interact with the immune system, as well as parallel projects aimed at better treatments for cancer and autoimmune diseases. We create proposals to address these important questions and use the funds from awarded grants to purchase reagents and supplies for our studies and to provide salaries and benefits to our researchers. We also support the next generation of engineers and scientists in getting the training they need (e.g., doctoral degrees) to make their own contributions to science and public health. If you'd like to support our efforts, contact us for a tour or make a tax-ductable donation now by clicking the button. Our current research would not be possible without the generous support of the public and private organizations below. Continue reading below to learn more. Biomaterials have many properties that are useful in the delivery of vaccines and immunotherapies, for example, targeting, controlled release, and delivery of multiple cargos. 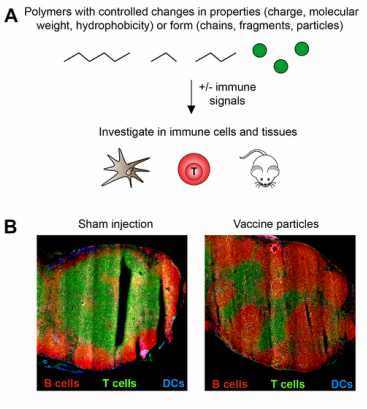 However, recent studies reveal many biomaterial vaccine carriers are able to activate immunostimulatory pathways, even in the absence of other immune signals. These observations could be leveraged in designing new materials that serve not only as carriers, but that also help actively direct the features of the immune responses that develop. This understanding and flexibility could lead to vaccines that are more potent and efficacious. However, there are many unanswered questions as to how polymer properties (e.g., size, charge, hydrophobicity, chemical functionality) link to activation of specific immune pathways, and on a larger scale, how these interactions alter the function of important tissues involved in immunity. Lymph nodes and spleen are two important sites that coordinate the duration, magnitude, and specificity of these responses. Our lab is studying how biomaterials with controlled features active immune cells and alter the function of lymph nodes and spleens (Panel A). We are first carrying out these studies in the absence of other immune signals, then introducing foreign molecules (“antigens”) and other signals to see how the presence of the biomaterials alters the response to these components. In one research direction, we are using rapidly degradable polymers to explore how the intrinsic immunogenicity varies as a function of the degree of polymer degradation. A second area is directly investigating the impact of polymers on the local lymph node microenvironment. For example, using a direct injection technique to introduce defined combinations of polymer particles and immune signals can cause dramatic shifts in the relative composition of T cells and B cells (Panel B) – cell types that contribute different features to combatting either viral or bacterial infections, respectively. New knowledge generated from this research direction could contribute to new opportunity to leverage intrinsic immunogenicity of polymeric vaccine carriers in future vaccines. Vaccines for diseases ranging from HIV to cancer would benefit from strategies that provide better control over specific characteristics of immune response. Biomaterials offer great potential in this area owing to their ability to co-deliver signal that can help polarize how immune cells differentiate. However, many biomaterials – including ubiquitous polymers such as poly(lactide-co-glycolide) – stimulate inflammatory pathways even in the absence of other signals (e.g., adjuvants). While this feature can be harnessed (See Project I above), this intrinsic immunogenicity also hinders rational design because the carrier can alter how other vaccine components are received. New materials that simplify vaccine composition could support more rational design to help tailor immune function. Polyelectrolyte multilayers (PEMs) are self-assembled coatings formed in a layer-by-layer fashion and stabilized by electrostatic interactions. In particular for vaccines, PEMs offer a simple method for controlling the loading and juxtaposition of film components, for controlled release, and for coating on complex surfaces at any length scales. We have developed a new class of PEMs assembled entirely from immune signals using peptide antigens and nucleic acid toll-like receptor (TLR) agonists as vaccine adjuvants (Panel A). These immune-PEMs (iPEMs) are assembled on colloidal particles through electrostatic interactions between polyIC – a double-stranded RNA that activates the TLR3 stimulatory pathway – and antigenic peptides exhibiting natural cationic charge or modified with cationic amino acid residues (e.g., arginine) (Panel B). Thus, polyIC serves as a potent molecular adjuvant and a polyanionic film component, while peptide serves as a vaccine antigen and a cationic component. These materials exhibit a core-shell structure (Panel C), are readily internalized by primary antigen presenting cells, and strongly activate TLR signaling. Compared to mice treated with soluble antigen and adjuvant, iPEM immunization promotes increased levels of antigen-specific CD8+ T cells in peripheral blood after one week. These enhancements result from increased DC activation and antigen presentation in draining lymph nodes (Panel D, left). iPEM-immunized mice also exhibit a potent recall response after boosting (Panel D, right), supporting the potential of iPEMs for rational design of well-defined vaccine coatings that provide high cargo density and eliminate synthetic film components. These concepts could be useful in a variety of vaccine settings, including cancer vaccination. Lymph nodes are key tissues that coordinate immune function. A large thrust in our lab is aimed at reprograming the lymph node microenvironment with biomaterials to control how T cells developed. These projects are aimed at two areas where this level of control could be transformative: cancer vaccination and autoimmune therapy. Autoimmune disorders, for example, occur when the immune system abnormally recognizes and attacks self-molecules. In multiple sclerosis (MS) – the most common autoimmune disorder – the body’s immune system mistakenly attacks myelin – a protein that insulates neurons in the brain (Panel A). The effects of this attack are devastating, slowly destroying motor function in patients until even simple tasks are impossible. Most patients initially have an intermittent type of MS, before developing progressive MS, which has no treatment. Existing treatments, though not curative, have provided some important gains for patients, but can often leave patients immunocompromised. A promising trend in MS therapies is the development of disease-modifying therapies aimed at redirecting immune function to promote immune cell populations called regulatory T cells (Tregs) (Panel A). Tregs can be generated to react only against myelin – the same protein that is targeted by cells attacking the body. However, Tregs respond differently when myelin is encountered, producing molecules that inactivate or destroy the inflammatory cells that attack myelin during MS (e.g. TH17 cells). Thus, myelin-specific Tregs might create a new opportunity to suppress harmful cells that attack myelin, while leaving the rest of the immune system unaffected. We are using nanoparticles (NPs) to deliver combinations of myelin and different classes of drugs that could help polarize T cell development toward Treg and away from inflammatory cells that attack myelin (Panel B). One of our projects in this area focuses on a glutamate receptor enhancer that alters how dendritic cells metabolize glutamate – a molecule over expressed in the brain of MS patients. This drug can alter DC function and help skew the cytokines secreted by these cells to bias the differentiation of T cells. In mouse models of MS, the net effect is polarizing T cells away from inflammatory TH17 cells and toward Tregs when mice receive daily systemic injections of PHCCC. However, frequent, continued treatment is required to generate and maintain therapeutic benefits. The use of PHCCC is therefore limited by poor solubility and the need for frequent dosing, as well as cell toxicity. We hypothesized that controlled release of PHCCC from degradable NPs might address these challenges by altering DC function to maintain efficacy with reduced treatment frequency and toxicity. Primary DCs readily internalized PHCCC-loaded NPs (Panel C), reducing DC activation and secretion of pro-inflammatory cytokines, while shifting T cells away from TH17 and toward Treg phenotypes. Importantly, PHCCC delivered to cells in NPs was 36-fold less toxic compared with soluble PHCCC (Panel D). In mice, treatment with PHCCC NPs every three days delayed disease onset and decreased disease severity compared with mice treated with soluble drug at the same dose and frequency (Panel E). This idea could serve as a new strategy for harnessing biomaterials to polarize immune function through controlled delivery of metabolic modulators. Recent clinical trials of intra-lymph node (i.LN.) vaccine injection have generated promising results in cancer and autoimmunity. We hypothesized that controlled release biomaterials in the context of intranodal vaccination could sustain exposure of the LN to adjuvants or immunomodulatory drugs to augment vaccine responses. To test this idea we encapsulated the TLR3 agonist polyIC in biodegradable polymer particles designed to release this adjuvant within LNs over several days. Using a non-toxic tracer, we developed a non-surgical approach for i.LN. injection and injected polyIC in soluble form or encapsulated in microparticles (MP-polyIC) or nanoparticles (NP-polyIC) (Panels A, B). MP-polyIC conferred ~4-fold and 2-fold increases in polyIC retention in LNs compared with soluble polyIC or NP-polyIC, respectively; prolonged retention correlated with a dramatic increase in polyIC uptake by LN-resident DCs compared with soluble polyIC, which was quickly cleared from LNs. Mice vaccinated with antigen mixed with MP-polyIC induced antigen-specific CD8+ T cell expansion 4-fold greater than soluble polyIC, which could not be matched by even 10-fold greater doses of soluble polyIC (Panel C). MP-polyIC vaccination also increased the percentage of IFN-γ and TNF-α secreting T-cells up to ~4-fold, indicating a polyfunctional vaccine enhancement (Panel D). In this project we developed a simple, modular approach for increasing adjuvant persistence in LNs, which can in principle be applied to any antigen. 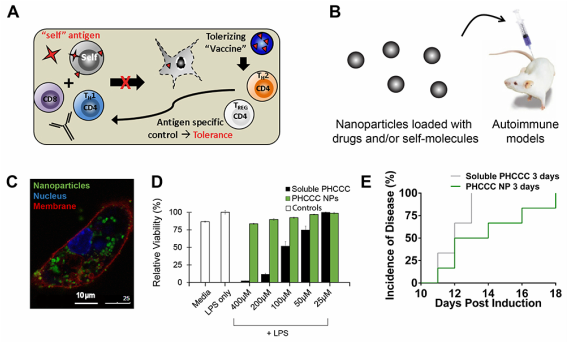 Compared with nanoparticle or microparticle biomaterial vaccines administered peripherally – where the majority of the dose remains at the injection site – this approach allows near-complete delivery of immunoactive cargo to LNs. The resulting T cell response is generated rapidly over seven days and reaches levels associated with some viral vectors after a single dose. This exciting basic finding on the role of adjuvant persistence in LNs suggests opportunities to apply this strategy to new or existing vaccines. A major challenge facing drug delivery is efficient targeting of bioactive cargo to specific cells or tissues. Delivery of macromolecular cargo (e.g., nucleic acids, proteins) to cells for example, is hindered by the inability of these cargos to escape membrane bound intra-cellular compartments endosomes) during cell delivery/uptake, resulting in cargo degradation. Developing new clinically-relevant treatments requires drug delivery systems that are both biocompatible and that overcome such cellular delivery barriers. Gold nanoparticles (AuNPs) have become of great interest in drug delivery because these materials can be functionalized with a range of biological cargos with minimal toxicity, and can be efficiently cleared from the body. Highly ordered self-assembled monolayers can be assembled on the surface of small gold particles, and mixtures of hydrophobic and hydrophilic organic ligands packed on the surfaces of AuNPs via chemisorption can self-organize into nanoscale “striped” surface morphologies that can be exploited to control the interactions of AuNPs with cells. We recently reported that highly water-soluble striped NPs that display amphiphilic mixed ligand shells composed of 11-mercapto-1-undecanesulphonate and 1-octanethiol are capable of penetrating the plasma membrane of cells, in contrast to AuNPs bearing the same hydrophilic/hydrophobic ligands in a disordered arrangement, which are taken up by endocytosis. Here we describe a new strategy for endocytosis-independent (i.e. cell penetrating) delivery of large, membrane-impermeable macromolecular cargo (e.g., oligonucleotides) using striped cell-penetrating AuNP carriers. To determine whether striped AuNPs would retain their cell entry properties when conjugated to large polar drug cargos, the cellular uptake of striped NPs (and non-striped control particles) conjugated with thiol-terminated oligonucleotides was assessed. Strikingly, striped AuNPs conjugated to both single-stranded and double-stranded oligonucleotides were taken up by cells in vitro, even under conditions where active uptake processes (i.e., endocytosis) were blocked by incubation at 4 degrees C or through the use of pharmacological inhibitors. Control sulfonate-capped particles lacking the striped domains failed to promote oligonucleotide uptake when endocytic processes were blocked in cells, and were taken up at 50% lower levels at 37 degrees C compared to striped particles. Confocal microscopy confirmed cystosolic localization of particle-conjugated oligonucleotides carried into cells by striped AuNPs. Total oligonucleotide uptake was inversely related to oligonucleotide length for single-stranded oligonucleotides attached to striped particles, and uptake of double-stranded oligonucleotides linked to striped particles was significant but did not vary as a function of oligonucleotide length. Together, these data suggest that striped AuNPs are of interest for intracellular delivery of membrane-impermeable drug cargos such as siRNA or immunostimulatory DNA, and ongoing studies are exploring the potential of these materials for modulating function in live cells. One approach to localized gene therapy that has seen increasing attention is surface-mediated deliver of DNA. Toward this goal, the Lynn lab designs materials that exploit the properties of polyelectrolyte multilayer (PEM) coatings. The deposition of polyelectrolyte films is a relatively new technique built around sequential dipping of a charged substrate into solutions of polycations and polyanions. This stepwise procedure can be repeated to control the properties and architecture of the resulting thin films (Panel A). Past work in the Lynn lab demonstrated that multilayered films containing hydrolytically-degradable poly(β-amino-ester)s (PBAEs) and DNA – a natural polyanion – mediate release of functional DNA into solution under physiologically conditions. One project focused on materials and methods that allow direct delivery of DNA or proteins to cells (i.e., transfection). By contacting cells with substrates coated with DNA-containing multilayered films, we were able to achieve spatially-localized gene expression in up to 40% of cells, without additional transfection agents (Panel B). Laser scanning confocal microscopy (LSM) in conjunction with films constructed from fluorescent DNA revealed DNA internalization by a high percentage of cells (Panel C, red signal), and that the cationic nature of polymeric film components played a key role in cell uptake and transfection. The facile coating process is a major advantage of the multilayer technique, and we were able to easily translate our approach to coating topographically-complex substrates, including intravascular stents used in interventional cardiology (Panel D). These coatings were smooth and conformal, exhibited DNA release profiles similar to those associated with planar substrates, and were stable during exposure of mechanical stress designed to mimic forces associated with arterial deployment (e.g. stent expansion, travel along vasculature). In collaboration with the UW – Madison Cardiology Unit, we demonstrated that stents coated with multilayers consisting of PBAEs and DNA encoding green fluorescent protein efficiently mediate gene expression in a rabbit model (Panel E; red=GFP Ab, green=tissue). Cationic lipids have been widely investigated as gene delivery agents owing to their ability to aggregate with DNA to form lipid/DNA complexes (lipoplexes) that are able to efficiently transport DNA into cells. However, conventional lipoplexes are generally active – and thus able to deliver DNA – beginning at the time they are first formed. As a result, maintaining spatial and temporal control over DNA delivery (i.e. transfection) to specific cells or tissue in a larger population presents a significant challenge. The design of functional lipids that permit localized or external activation of cell transfection could lead to new approaches for delivering biological cargo. Toward development of this new class of functional materials, our approach focused on a cationic, ferrocene-containing lipid (Scheme 2). The charge density of this lipid can be transformed from +1 in the reduced state to +3 in the oxidized state. By complexing plasmid DNA with lipid, we demonstrated the ability of these lipoplexes to mediate transfection. The extent of transfection, however, greatly depends upon lipid oxidation state. Lipoplexes prepared from reduced lipid mediate high levels of transfection (“On”), while lipoplexes prepared using oxidized lipid yield very low levels of transfection (“Off”). We identified corresponding differences in the properties of these two types of complexes using scattering methods, zeta potential, microscopy, and cryoTEM. Building on this work, we correlated material property differences to differences in uptake and trafficking of these two types of materials by cells.